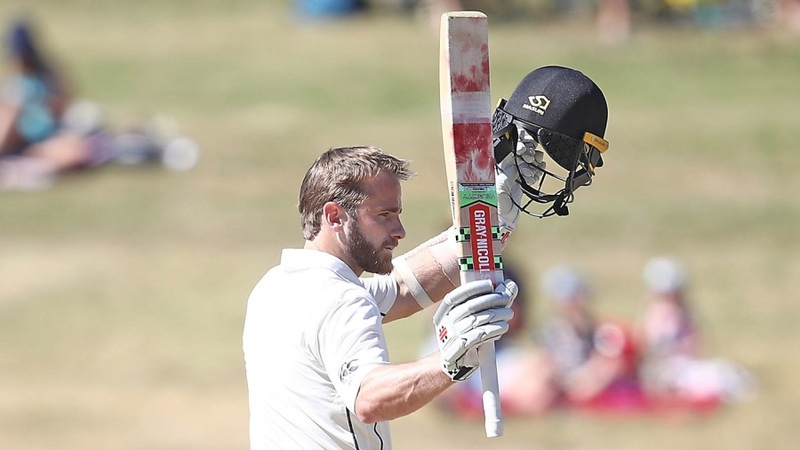 Kane Williamson's second Test double century followed by four wickets in the evening session put New Zealand on course for a comprehensive victory in Hamilton as Bangladesh wilted against a batting and short-ball onslaught. New Zealand compiled their highest ever total, 715 for 6 declared, as they raced along before Williamson declared the ball he brought up his latest milestone. Bangladesh ended the day with captain Mahmudullah and Soumya Sarkar at the crease, with Liton Das the only recognised batsman to come and still 307 runs from making New Zealand bat again. They just about survived a bouncer barrage which Tamim Iqbal had tried to counter with a battling 74 before eventually succumbing to Tim Southee. It had been an unforgiving experience for the Bangladesh bowlers as Williamson and Colin de Grandhomme added 110 in 15 overs after lunch to swell an already huge total. de Grandhomme enjoyed the freedom to play his shots, striking five sixes including three of Mehidy Hasan, as New Zealand eclipsed their previous highest total of 690 against Pakistan in Sharjah in 2014 and in the same over broke the 700 barrier. Mehidy had another tough time with the ball, finishing with 2 for 246 which were the most expensive figures by a Bangladesh bowler in a Test innings. The new-look pace attack didn't fare any better either, as Khaled Ahmed, Jayed and debutant Ebadat Hossain combined to take 1 for 369 from their 87 overs. There was nothing to write home about. Williamson, who was dropped on 81 at slip on the second evening, was content to play the supporting act to the more aggressive Neil Wagner, who hit a career-best 47 off 35 balls as nightwatchman, and de Grandhomme. His only moment of aggression was taking on Jayed during one over in the morning session when he struck three fours off the seamer. He had brought up his century, and became the fastest New Zealander to 6000 Test runs, early in the morning session and it felt the only way of him not converting into something much larger was an error from himself. That mistake never came as he eased his way beyond 150 against a tired attack and a deep-set field. His main challenge appeared to be getting to 200 before he wanted to declare at the mid-afternoon drinks, but a pull off Jayed from his 257th delivery got the job done. It was marked in typically understated fashion by the captain. Tamim struck Southee for a six and two fours in an over to push back at the home side, before Shadman Islam joined in with three fours of his own. New Zealand dried up the boundaries in the post-tea period, as Wagner ramped up the short balls, and the verbals. The first hairy moment came in the 21st over when Wagner struck Tamim's dangling bat as he ducked and left it exposed. Though he recovered to pull him properly in the next ball, the doubt had been placed. Shadman top edged a pull in Wagner's next over, to end another promising start, having made 37 in an opening stand of 88. Mominul Haque fell immediately after clipping Trent Boult for two fours, only to edge a loose drive to be sharply caught at slip by Ross Taylor. Mohammad Mithun followed soon after, edging Boult to gully for a duck without any footwork. Southee then removed Tamim amid the chat going on with Wagner. Whether that disrupted the batsman or not, Tamim got himself in a horrid tangle as walked outside leg stump to a short delivery then left his bat in the air as he ducked. The catch for BJ Watling allowed him to equal Adam Parore's tally of 201 dismissals as the most by a New Zealand keeper. It had been a fighting effort from Tamim, but his dismissal put the game in danger of a three-day finish. However, Mahmudullah survived a DRS call first ball that could have gone either way if the third umpire had believed the Real-time Snicko to caught behind appeal against Southee, but he ruled the spike did not match up with the pictures. Mahmudullah and Soumya survived the remaining 12 overs with several tight moments but managed to get the body out of the way on most occasions although Soumya was almost brilliantly caught by Wagner on the long leg boundary two overs from the close.